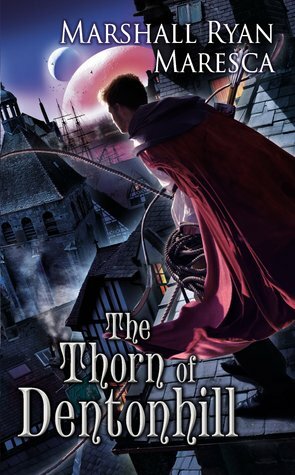 I decided to pick up the Thorn of Dentonhill after reading Maresca’s second published book, A Murder of Mages. Both titles are set in the city of Maradaine, but the stories do not overlap as they focus of entirely different character in (mostly) different areas of the city. This particular novel is a fantastic mash-up of the Name of the Wind, the Lies of Locke Lamora, and the Dresden Files. These happen to be three of my favorite books, so I absolutely loved reading the about Veranix Calbert, who is the Thorn by night and a magic student at the University of Maradaine by day. I liked Veranix quite a lot- he had honorable intentions and actually knew how to get himself out of a scrap without relying on anyone to rescue him. He has a solid friendship with Kaiana and Delmin, who he relies on to get him out of other uncomfortable situations, like knife wounds to the shoulder and being caught out after curfew. His past starts out as somewhat mysterious, but the reader is eventually let in on it and we begin to understand why Veranix is provoking big-time gang bosses by trashing their drug pick-ups and making off with magical items. Okay, well the magical item thing seems to have been a onetime affair, but the drugs busts(?) are a regular thing. I’m going to try not to go around spoiling things willy-nilly, so you’re just going to have to go buy the book to find out what I’m talking about. I enjoyed learning more about Maradaine in this novel- the cities neighborhoods have all sorts of subtle differences. The descriptions of the gangs and their allegiances/politics were also really cool to read about and I was very fond of the Rose Street Princes. Maresca is slowly building a richly detailed portrait of Maradaine by focusing on different neighborhoods and castes of characters in each of his books. I am very curious to see what he will write about the locals in North Maradaine, where the more affluent are said to live. In short, Maresca has wrought an exceedingly fine story with a vibrant setting and multi-layered characters. He is on my list of auto-buy authors now and I dearly wish his books came in hardcover. The cover art is great, and I prefer hardcover copies of my very favorite books. Go buy this because reading it is totally worth your time!